The markets are now closed. Stop thinking about the economy -- in fact, do anything except think about the economy. 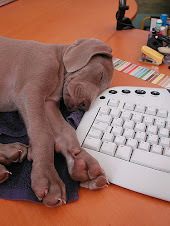 I'll be back on Monday morning. 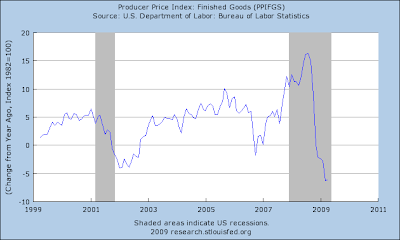 The Producer Price Index for Finished Goods increased 0.3 percent in April, seasonally adjusted, the Bureau of Labor Statistics of the U.S. Department of Labor reported today. This rise followed a 1.2-percent decline in March and a 0.1-percent increase in February. At the earlier stages of processing, prices received by producers of intermediate goods moved down 0.5 percent following a 1.5-percent decrease a month earlier, and the crude goods index advanced 3.0 percent after declining 0.3 percent in March. Also note it appears commodity prices have hit bottom and are currently inching higher right now. The Consumer Price Index for All Urban Consumers (CPI-U) increased 0.2 percent in April before seasonal adjustment, the Bureau of Labor Statistics of the U.S. Department of Labor reported today. 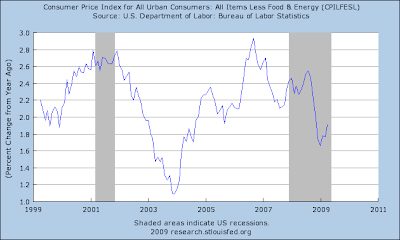 This index has fallen 0.7 percent over the last 12 months, due primarily to a 25.2 percent drop in energy prices. The year-over-year declines in March and April are the first since 1955. Also moving higher and has never been negative although -- like PPI -- it had a major drop at th end of last year. Gross domestic product in the 16-member euro region dropped 2.5 percent from the fourth quarter, when it fell 1.6 percent, the European Union’s statistics office in Luxembourg said today. That’s the biggest drop since the euro-area GDP data were first compiled in 1995 and exceeded the 2 percent decline economists expected in a Bloomberg News survey. Inflation held at 0.6 percent in April, a separate report showed. In Germany, Europe’s largest economy, GDP dropped 3.8 percent in the first quarter from the previous three months. That’s the biggest drop since data were first compiled in 1970. Italian GDP fell 2.4 percent, the most since records began in 1980, and the French economy shrank 1.2 percent in that period. The economies of the Netherlands and Austria also contracted. In Japan, machinery orders fell 1.3 percent in March, a sign that managers remain wary of upgrading factories and equipment before a recovery takes hold. Japan next week may say its economy shrank a record 4.3 percent in the first quarter from the fourth, according to a survey of economists. One of the bright spots for the US economy at the end of the latest expansion was export growth. But -- who are we going to export to? The latest retail sales news was followed by a fairly bearish commentary. However, I disagree with this sentiment for the following reasons. Durable goods purchases dropped hard in 4Q08, rose at the beginning of '09 but have moved lower. 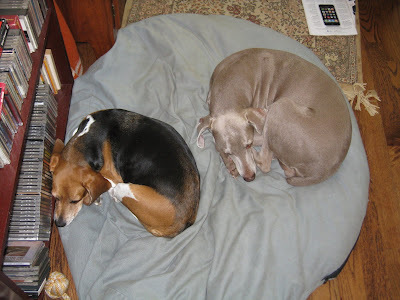 But the severity of the move is moderate. Non-durable purchases are clustering right around the $2.320 trillion level. In other words, the total purchases of "stuff" is moderating. People are feeling better which means they will be more inclined to spend money. On the weekly chart, notice the clear double top formation along with the lower RSI and MACD reading on the second top. Prices fell from that level and formed a bear market flag pattern. However, prices have now fallen from that level and are moving towards support at the 50 week SMA. Finally, the RSI and MACD continue to move lower, indicating this trend will most likely continue. On the daily chart we see the downward move from the bear market flag more clearly. In addition, prices are below all the SMAs, the shorter SMAs are below the longer SMAs and all the SMAs are moving lower. 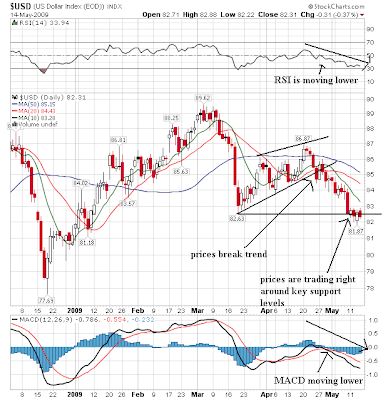 Finally, the RSI and MACD are moving lower. Bottom line -- we have a very bearish pattern developing on both the weekly and daily chart. The 10 day chart gives us a nice anatomy of the correct. 1.) Prices gapped lower on Monday. 5.) The overall trend of the movement is lower; the highs can be connected with a downward sloping trend line. U.S. foreclosure filings in April rose to a record, affecting one in every 374 housing units, and bank repossessions in particular may spike in the next few months, RealtyTrac reported. Foreclosure filings -- defined as default notices, auction-sale notices, and bank repossessions -- were reported on 342,038 U.S. properties in April, up less than 1% from March and up 32% from April 2008, the Irvine, Calif., real-state consulting firm reported. "Much of this activity is at the initial stages of foreclosure -- the default and auction stages -- while bank repossessions ... were down on a monthly and annual basis to their lowest level since March 2008," Chief Executive James J. Saccacio said in a statement. "This suggests that many lenders and servicers are beginning foreclosure proceedings on delinquent loans that had been delayed by legislative and industry moratoria." A lot of these foreclosures are not included in the inventory of homes available for sale (existing home inventory). This creates a problem from a measuring perspective because the under count in homes available for sale means its harder to estimate guess the rate of price declines. And my big data point with housing is the rate of price declines -- so long as they are in the double digits we are nowhere near a bottom in housing. Delinquency rates and defaults on office and retail buildings and hotels have more than doubled in just six months. For apartments and industrial buildings, the rates have increased more than 80 percent, according to Reis Inc.
That is an incredibly fast rate of acceleration; statistically it is far more than just a blip. It indicates there a big problem somewhere. The risk to the economy is unknown, but likely underestimated in the government's stress test of 19 major banks. The results released last week projected that should the recession worsen, the losses from commercial real estate loans could hit $53 billion, or 8.5 percent of their overall loan losses over the next two years. The exercise notably left out the majority of the regional and local lenders, which hold a big chunk of the nation's $3.5 trillion commercial property loans on their books and remain vulnerable. Looks like a regional and local stress test are in order, eh? Under a proposed raft of reforms, regulators could be given authority to force many standard over-the-counter derivatives to be traded on regulated exchanges and electronic-trading platforms. That would make it easier to see prices and make markets more transparent. The move, the latest step to tighten federal regulation of finance, is designed to address markets such as those for credit-default swaps, which many say exacerbated the financial crisis. Any such moves would require congressional approval. These rules are obviously targeted at credit default swaps. For those of you who want to get some more basic information on these derivatives, here is a link to the International Swaps and Derivatives Association. o CCPs must impose robust margin requirements and other necessary risk controls and ensure that customized OTC derivatives are not used solely as a means to avoid using a CCP. o For example, if an OTC derivative is accepted for clearing by one or more fully regulated CCPs, it should create a presumption that it is a standardized contract and thus required to be cleared. The margin requirements are critical. There have been stories in the press that some companies like AIG were writing naked credit default swaps. This is incredibly stupid, especially at the level AIG was playing. The devil will be in the details above. For example, what is a "conservative capital requirement" or "initial market requirement?" We won't know until the law gets written. I'm assuming the reporting requirements will fall in line with standard SEC regulations. + Recordkeeping and reporting requirements (including audit trails). + Requirements for all trades not cleared by CCPs to be reported to a regulated trade repository. # CCPs and trade repositories must make aggregate data on open positions and trading volumes available to the public. # CCPs and trade repositories must make data on individual counterparty's trades and positions available to federal regulators. + The movement of standardized trades onto regulated exchanges and regulated transparent electronic trade execution systems. + The development of a system for the timely reporting of trades and prompt dissemination of prices and other trade information. + The encouragement of regulated institutions to make greater use of regulated exchange-traded derivatives. The point of the above information is to develop some kind of standard record keeping system which will be used for the industry and regulators. One of the big problems faced over the last few years is we had no idea who had written when contracts to whom. This is critical information what must be maintained. Again -- this is general information. We'll need to develop the details before we know whether this will work or not. Oil's weekly chart is still very bullish. The MACD and RSI have been rising for some time. 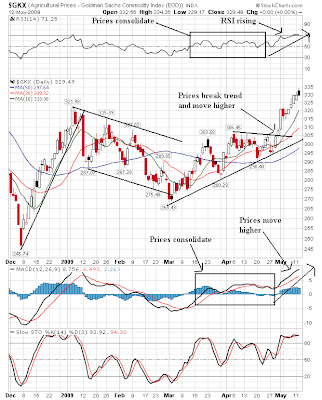 Prices formed a triangle consolidation pattern at the end of a long sell-off and are now moving higher. Prices recently broke through a key resistance area. The daily chart is in a new upswing. First, note that prices have been rising since the end of February. 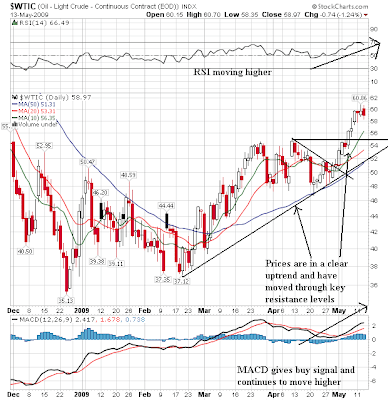 In addition, the MACD recently gave a buy signal and is now moving higher and the RSI has been advancing as well. Finally, the price/SMA picture is bullish: prices are above all the SMAs, the shorter SMAs are above the longer SMAs and all the SMAs are moving higher. Crude oil supplies are still at high levels. In other words, we don't need to buy a lot of raw material right now. Gas stocks are falling but are still well within norms. This means we need to convert more oil, but as mentioned above, we already have enough supply. 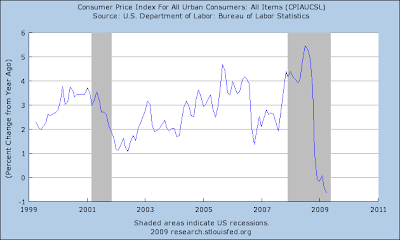 Tells us demand increased in March, but is still below 2007-08 levels. The QQQQs -- which started the sell-off -- are now looking for the horizontal trend line or the 10 day SMA as support for this move lower. The IWMs have broken through the 10 and 20 day SMA and have moved through the 10 day SMA. We are now firmly in a correction. The U.S. Census Bureau announced today that advance estimates of U.S. retail and food services sales for April, adjusted for seasonal variation and holiday and trading-day differences, but not for price changes, were $337.7 billion, a decrease of 0.4 percent (±0.5%)* from the previous month and 10.1 percent (±0.7%) below April 2008. 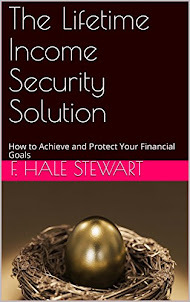 Total sales for the February through April 2009 period were down 9.2 percent (±0.5%) from the same period a year ago. The February to March 2009 percent change was revised from -1.2 percent (±0.5%) to -1.3 percent (±0.3%). 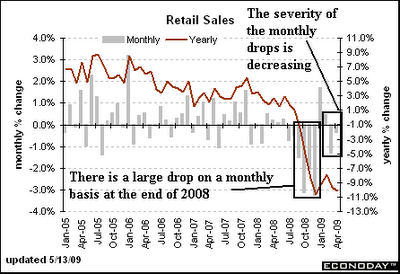 Retail trade sales were down 0.4 percent (±0.7%)* from March 2009 and 11.4 percent (±0.7%) below last year. Gasoline stations sales were down 36.4 percent (±1.5%) from April 2008 and motor vehicle and parts dealers sales were down 20.7 percent (±2.3%) from last year. Let's look at some of the individual data points. 1.) March to April sales were down. 3.) February to March sales were revised lower. 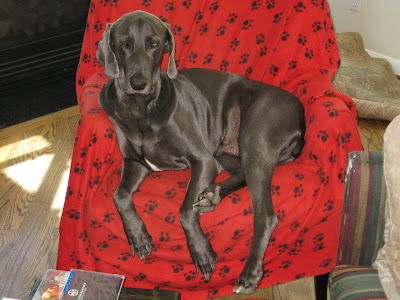 Click on all the images for larger images. The above chart is from the Census report. Notice that in February there was an overall increase. March and April saw a downward move BUT April's move lower was less severe. This chart is from Econoday. Notice that we have two different areas. The first occurred at the end of last year when the month over month rate of decline was severe . However for the last three months we have seen a less severe rate of decline. 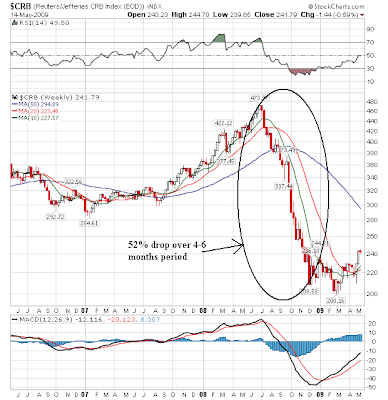 In addition, the year over year chart appears to be forming a bottom. This does not mean we are out of the woods yet. In fact, we are far from out of the woods. The consumer is still losing jobs at a rapid rate, his hours of work are decreasing, he is heavily in debt and his net worth is taking a nosedive. Simply put, this is not the time when consumers will start a new spending binge. But, there are indications the bleeding is stopping, or at least slowing down. While IBD is not know for their reporting and writing, they are trying to make strides in that area. To that end, they have a long article today on China's use of the global recession as a way to increase its global economic reach an power. Officials at cash-flush Chinese sovereign funds make the rounds in Indonesia, meeting with the president and other power brokers, and lending out billions to build ports, rails and power plants to support more exports. Brazil's national oil company gets a $10 billion Chinese loan to finance crude facilities. Oil-rich Venezuela holds talks on China sinking billions more into a development fund. And Argentina, a major exporter of iron ore, gets access to more than $10 billion in Chinese currency. The goal, experts say, is to secure long-term access to resources, bring prosperity to rural China by continuing to grow its industrial economy and hone the country's economic edge. Along the way, China aims to expand its clout by offering a cornucopia of financial capital and other aid to nations, such as Indonesia, that are hard-pressed for cash from other sources. "At high levels (in China), there is a definite recognition that the world has changed and that China's position in the world is stronger and needs to be asserted — not for any expansionist purposes, but just to protect their own economy," said Robert Lawrence Kuhn, a senior Citicorp adviser on China and a biographer of former Chinese President Jiang Zemin. Kuhn is the author of a forthcoming book, "How China's Leaders Think." Lieberthal says China has stepped up its pace to exploit depressed commodities prices and shown a thirst for investment and credit in developing countries. "China is one of the few countries with a lot of cash to spend now" on a large-scale "go out strategy," Lieberthal said in an e-mail interview. China holds more than $1.7 trillion in foreign-exchange reserves, mainly in U.S. Treasuries and other fixed-income assets. Sources close to China's ruling party say Beijing is moving more overtly now to nail down long-term resource deals on a global basis. These sources say it boils down to an attempt to build a "parallel trade universe" with resource-rich developing nations that will ensure access to oil, ore, food and other resources to feed China's growing economy. The investment and trade footholds are long term and meant to be developed gradually over the next 10 to 20 years. Sources close to China's ruling party say the aid-for-trade deals target developing nations that aren't part of the Organization for Economic Cooperation and Development, which is mostly made up of developed nations. This means the trade deals are done outside OECD guidelines that try to level the playing field in officially supported export credits, cash payment requirements, repayment periods and other terms. China is not an OECD member. 134 out of 152 metropolitan statistical areas1 reported lower median existing single-family home prices in comparison with the first quarter of 2008, while 18 metros had price gains. Everything else in their press release is so intermixed with spin that it's pointless. Remember -- housing won't be at a bottom until we see stabilization in the year over year rate of decline in home prices. Industrial metals dropped hard at the end of last year (in conjunction with all commodities). However, prices consolidated at a bottom for about 5-6 months and have since risen through key resistance areas. 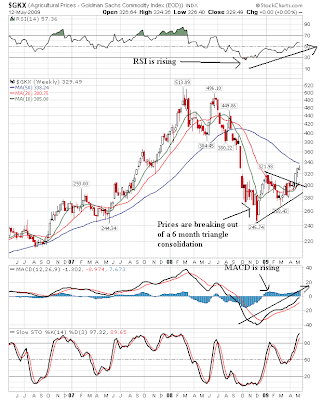 The RSI and MACD have been rising along with the rally. 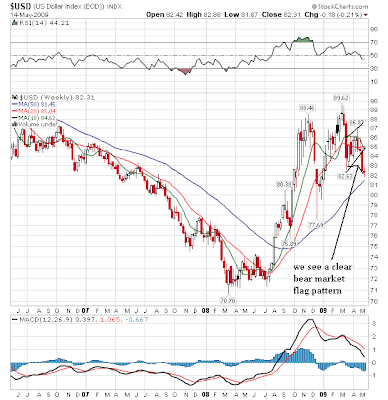 The 10 and 20 week SMAs are now moving higher and are both below prices. On the daily chart we could have an issue. 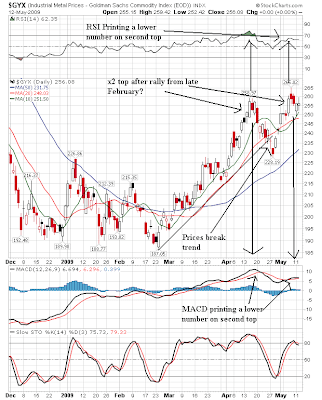 Note that prices have formed a double top, with the first top occurring in mid-April and the second occurring in early May. But also note both the RSI and MACD printed a lower number than on the previous high. This could indicate the rally is stalling -- or at least moving sideways for now. To that end, I've included the stochastics which are a better indicator for a sideways moving market and they are giving a short-term sell signal right now. Agricultural prices are in a good bull market position right now. 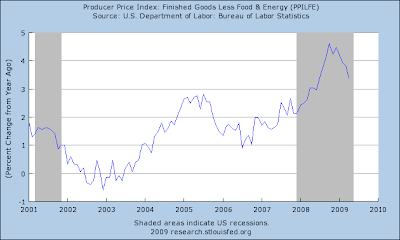 After falling at the end of last year, prices consolidated. Now they have moved out of that position and are moving higher. Both the MACD and RSI are confirming the upward trend. However, the SMAs are still bunched together -- we need them to form a more bullish pattern for this rally to kick into high gear. On the daily chart, notice we're at the end of a consolidation period. Prices rallied from the beginning of December to January, made a disciplined move lower until early March followed by a rally. 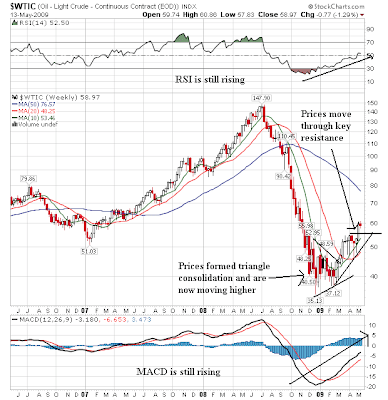 Now prices have moved through upside resistance with a confirmation coming from the MACD and RSI. 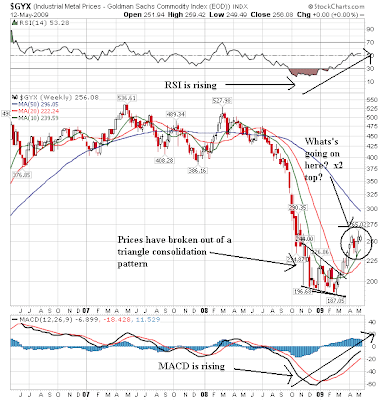 Notice that on the weekly chart, the RSI and MACD have a long way to go, indicating this rally might have legs. The SPYs are still above their upward sloping trendline. Today, the IWMs moved through two important levels of support (breaking those two trend lines) and are currently at one over (the 10 day SMA). Central Bankers See "Inflection Point"